Swash Limited Edition. FASHIONARY have teamed up with digital printing guru SWASH LONDON for a series of limited editions patterned with SWASH's iconic prints! FASHIONARY have teamed up with digital printing guru SWASH LONDON for a series of limited editions patterned with SWASH's iconic prints! With Sarah Swash and Toshio Yamanaka's signature hand-drawn and hand-painted artworks on durable fabric, Fashionary gets a completely unique look! Swash are Sarah Swash and Toshio Yamanaka, a duo celebrated for their signature hand-drawn and painted artworks, instilling their digital prints with the charm of human touch. After meeting at Central Saint Martins in 2001 the pair spent time in Sarah's hometown of Penzance, Cornwall before working in Toshio's home of Japan for a year. The brand emerged after Sarah and Toshio won the prestigious Hyères prize in 2004. 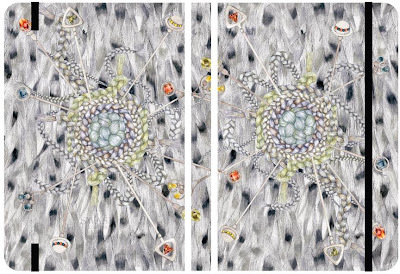 They were later invited back to exhibit 100 framed drawings, a scarf retrospective and 3D sculptural installation. Today they are based in creative East London. The name "FASHIONARY" comes from "Fashion + Dictionary + Diary". 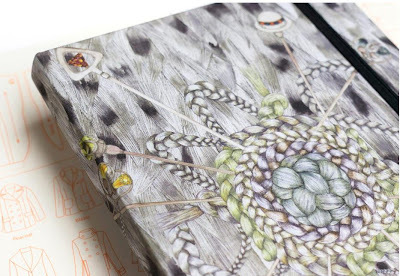 The sketchbook is combined with intensive fashion information and blended figure templates. It is the perfect tool for brainstorming, fast sketching and quick referencing. 400 templates for instant sketching. What make the book special is that the templates are barely visible and you can use the pages as normal sketchbook if you prefer. 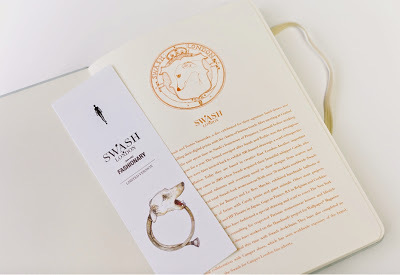 Another important landmark in the partnership came in 2005 when Swash acquired their beautiful whippet Candy, who quickly became an inspirational talisman and recurring motif in their designs from scarves and accessories to the more recent total-Swash-look womenswear. With over 70 stockists worldwide Swash have created anniversary scarves for Barneys and Le Bon Marché, exhibited handmade balloons at Liberty and adorned 5 floors of Isetan with Candy prints and giant animals. Other store projects include those at Tomorrowland and HP Theatre in Japan, Gago in France, RA in Belgium and Cochinechine in London. Sarah and Toshio have fashioned a special drawing and scarf to cover The New York Times "T Magazine” as well as consulting for respected Parisian womenswear houses and lifestyle brand Habitat. Most recently the duo have worked on the Handmade project for Wallpaper* Magazine and again decorated Hyéres festival this time with Swash deckchairs. They have also completed an international collaboration with Camper shoes, which has seen worldwide exposure of the brand, closest to home are the Swash for Camper London bus adverts.